LOVE LOVE LOVE - Gourmet Chocolate Covered Kale Chips. If you've never had kale chips, don't turn up your nose. You HAVE to give them a try. They are one of my favorite raw snacks ever! I've made them cheezy and I've made them spicy, but this time, I've made them chocolaty!!! Simple, easy and nutritious. Make a lot, because they don't last long! Now available at the Rawfully Tempting Cafe. The fun thing about raw food, is you can substitute a lot of things. The results may vary, but you can usually throw something yummy together. Try using a little more cacao powder....and increasing the hemp a little...i'm just guessing, but how bad can it be? Let me know how it turns out!!! What exactly is cacao paste, and where would I get it? And when you say "process," you mean in a food processor, right? So I should be dehydrating a purée? Rachel, click on the link above to learn more about cacao paste. This recipe can be processed in a blender or food process. I use a blender. You make a puree with all of the ingredients listed, EXCEPT the kale. Put the torn kale leaves into a large bowl and little by little massage the thick blended mixture into the kale leaves. It works best if you do each leaf, one by one. 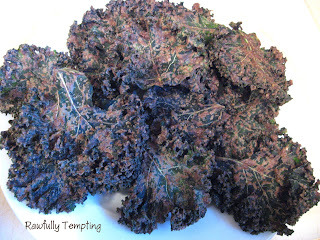 It's time consuming, but dehydrated kale chips are soooooo delicious! Let me know how you make out!